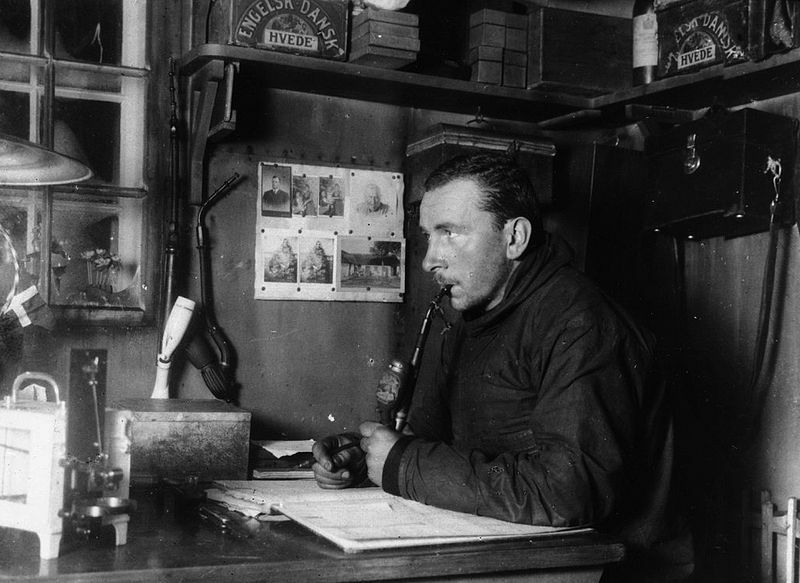 Alfred Wegener pictured during an expedition to Greenland of 1912-1913. Alfred Wegener, (full name Alfred Lothar Wegener), was born in Berlin on November 1, 1880. He gained a doctoral degree in Astronomy from the University of Berlin in 1904. After 1906 Alfred Wegener participated in several expeditions to Greenland where high altitude air masses were tracked and where the existence of so-called "jet streams" of air at high altitude became scientifically established. Alfred Wegener actually met his end on one of these expeditions to Greenland. This particular expedition had been intended to take readings of the arctic weather in Greenland during the course of a year. Wegener led a party to re-provision a forward camp, known as Eismitte, (or Mid-Ice), deep the interior which was running out of fuel and and had not already been re-supplied due to a late and limited summer thaw that year. The party set out in late september, 1930, and suffered terribly in temperatures of -60o C in replenishing the forward camp's stores. Only Wegener and two others actually made it through with twelve others from the original party returning to a base camp. The journey from the base camp to the forward camp having taken all of four weeks to complete. The stores Wegener had helped to bring were, however, very limited and he and one other person volunteered to leave the forward camp with its replenished fuel and foodstuffs just taking with them enough stores to reach the safety of the base camp. It was by now well into October and winter was closing in again - they even seem to have intended that their sled-dogs would have to survive by consuming their weaker comrades who were to be sacrificed in order to keep the stronger ones alive. Neither Alfred Wegener, nor his comrade on this perilous journey, Rasmus Villumsen, reached the base camp alive. Wegener at the presumed time of his death (early November 1930), was fifty years of age and had been a notably heavy smoker. His body was recovered in May, 1931 - that of Rasmus Villumsen has never been found. From circa 1911 Alfred Wegener, after being influenced by a scientific paper he had come across that listed fossils of identical plants and animals found on opposite sides of the Atlantic, began proposing a then most controversial theory which held that the continents of the earth had once been joined together but had drifted apart through a process that he explicitly, by circa 1915 - with the publication of the first edition of The Origin of Continents and Oceans, a book outlining Wegener's theory, - seems to have referred to as Continental Drift (actually - in his own mother tongue - as Kontinentalverschiebung or die Verschiebung der Kontinente). As he later wrote: "A conviction of the fundamental soundness of the idea took root in my mind." It was only in the early 1950s with the emergence of the new science of Paleomagnetism that Alfred Wegener's controversial theory of Continental Drift began to be taken anything like seriously by mainstream geologists and other scientists culminating in an acceptance by mainstream science of a revised Theory of Plate Tectonics in the 1960s.